Issued July 16, 2002, to Nintendo Co. Ltd. The ‘056 patent set out to solve a practical problem that had existed in previous vide games. Before, if a background image (e.g., a wall) or another character came between the player and the “camera,” the player could not view his character in that three-dimensional world. 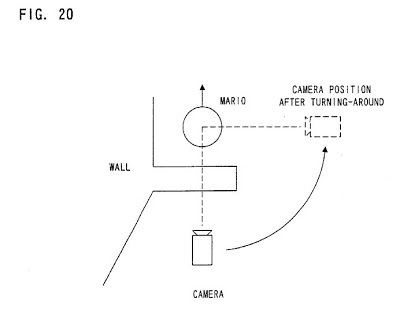 In the system described here, however, if it is determined that there is a possibility of a collision between the operable object and a polygon plane of the other object, the camera position can be changed so that the other object does not exist between the operable object and the camera. A three-dimension image processing apparatus includes a CPU. When the CPU detects by collision determination that another object, e.g., a wall, is existent between an operable object and a camera, it calculates such a moving angle of the camera that an eye of the camera to the operable object is not obstructed by the other object. The camera is moved in accordance with the moving angle to a position where the operable object and the other object existing in a photographed three-dimensional space are displayed on a display. 1. An image processing apparatus for use in displaying an image of a player controlled object and another object existing in a three-dimensional space from a predetermined point of view, comprising: an external memory for storing data of the player controlled operable object, the other object, and a predetermined program; an input device which inputs data which alters the position of the operable object in the three-dimensional space; operable object position data generating circuitry which generates player controlled object position data so as to alter the position of the player controlled object in the three-dimensional space based on the data input via said input device; three-dimensional data generating circuitry for creating three-dimensional data based on the data stored in said external memory and the operable object position data; a point of view position data generator for generating position data representative of a point of view position in the three-dimensional space for viewing the player controlled object; a detector for detecting whether or not the other object is existent between the viewing position and the current player controlled position; point of view position data altering processing circuitry for altering the point of view position data such that the other object is not existent between the point of view position and the player controlled object position when said detector detects existence of the other object; a display data generator for displaying the image of the player controlled object from a predetermined position in the three-dimensional space based on the three-dimensional data and the point of view position data; and image signal generating circuitry which outputs an image signal to said display based on the display data created by said display data creating generator.